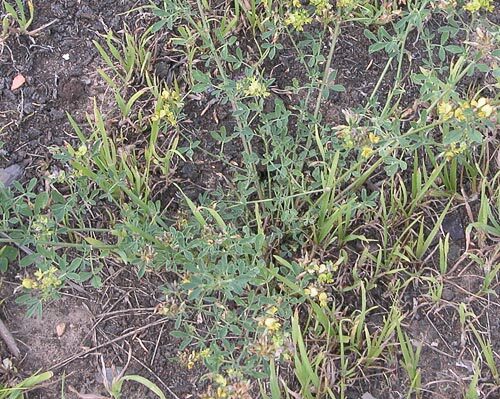 AgroAtlas - Relatives - Medicago glutinosa M.B. - Medicago glutinosa. Medicago glutinosa M.B. - Medicago glutinosa. Family Leguminosae Endl., genus Medicago L., subgenus Medicago Tutin. Perennial herb. Plant is 30-45 cm tall; stems decumbent, ascending to erect, arising from the crown, sparsely covered with simple, appressed hairs. Stipules full at the upper nodes of the stem, toothed in their basal part at the lower nodes. Leaflets on upper side are glabrous, 13-25 mm x 5-11 mm, at the upper nodes narrowly obovate, often truncate, at the lower nodes broadly obovate; margin somewhat irregularly serrated in its upper third, ending in a small, terminal tooth. Peduncle longer than petiole, bearing 5-14 florets gathered in a compact raceme (0.5-1.8 cm) with a small terminal cusp. Florets are comparatively large, 12-15 mm long. Pedicel shorter than the calyx tube; bract shorter than or equal to the pedicel. Calyx is 6-6.5 mm long, covered with glandular and/or simple hairs; teeth longer than the tube. Corolla yellow, the color often cream or light yellow in buds and freshly opened florets, changing to fully yellow after a few hours; often a different shade of yellow (lighter or deeper) is found in the middle of the floret; standard about size is 14 mm x 9 mm, ovate; wings slightly longer than or as long as the keel. Pods coiled in 1.0-3.5 coils, 7-13 mm in diameter, with an opening in the center; thickly covered with many-celled, glandular hairs. Veins on the pod face anastamose soon after emerging from the ventral suture. Blossoms in May-June; seeds ripen in June-September. Plants cross-pollinate. 2n=32. Species is endemic to Caucasia. The species is adapted to comparatively moist growing conditions (precipitation amounts of 500 mm or more, mainly during spring and summer) and grows at sub-alpine elevations (600-2,000 m above sea level) on sub-alpine meadows, among brush, in forest glades, along river valleys, and in sub-clay and rocky soils. The species, being endemic to the mountains of the Caucasus, which receive high amounts of precipitation during the vegetation period, may harbor valuable characteristics that can be transferred to cultivated alfalfa. Very promising forage plant for improving pastures in southern areas. It is drought and heat-resistant. It is characterized by longevity. Lesins K.A., Lesins I. 1979. Genus Medicago (Leguminosae). A Taxogenetic study. The Hague (The Netherlands). Dr. W. Junk bv Publisher. 228 p.
Vasil.chenko I.T. 1949. Alfalfa as the best fodder crop. Leningrad: Academy of Science of the USSR. Series 1. Issue 8. 248 pp.